When designing volunteer training, your biggest challenge may be how to create a complete program that doesn’t scare volunteers away. Often, organizations have daunting amounts of information volunteers must learn in order to perform with confidence. Programs must be assured that volunteers know their role so that they can manage risk. Volunteers want to learn new things, have fun, and deliver on their missions with pride. So, how can volunteer and program needs be balanced? By developing training that works with the brain, not against it. Wondering what your volunteers think about your training? 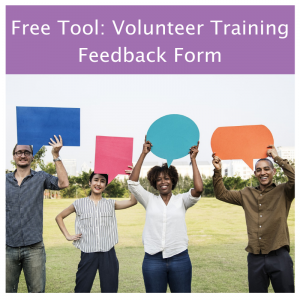 Use our free, ready-to-use form to get candid feedback from volunteers about how to improve your orientation and training courses. This two-page form assesses learners confidence, the instructor, facilities, methods and media, and general satisfaction and includes fields for gathering open-ended comments. Don’t guess what volunteers think. Ask them! Improve Your Training! Let Volunteers Guide You! Based on how our brains learn, try these strategies to help volunteers learn without being overwhelmed. If we practice the wrong thing for too long, we form ”bad habits” that become ingrained. So, it is very important to get timely feedback before habits solidify. The “stair step” structure is the most effective learning architecture for novices and is a great way to integrate timely practice into learning. With this approach, the instructor explains the concept, illustrates how to do the skill, invites learners to try it, and finally gives supportive feedback. Interactivity is the key. It’s not about designing for individual “learning styles” (a long-held training myth that has been debunked by research). Case studies and scenarios lend themselves to this type of architecture and give volunteers the chance to practice before they try their new skills out in the real world. Learning is also an emotional process that is fueled by hormones, three in particular. Adrenaline, fueled by anxiety and our “fight or flight” response, makes it hard for the neurotransmitters to carry messages across the synapses in your brain; this causes some people to “blank out” on tests. Dopamine is released in the brain when something is perceived as new, exciting, or rewarding. Dopamine also helps regulate movement and emotional responses; it enables us not only to see rewards but to also take action to move toward them. If dopamine levels are low, new information goes in one ear and out the other. With these hormones in mind, build activities into your training that help volunteers relax and have fun, and be sure to reward them for achievements with praise as well as new information that piques their interest. If we flood learners with too much information, mental overload occurs. In fact, research estimates that only 3-5 pieces of information can be stored in the working memory at a time. If our working memory is corrupted by cognitive overload, we are unable to store knowledge into our long-term memory. Metacognitive skills make us aware of our own knowledge, the ability to understand, control and manipulate our own cognitive process. In short, it is how we learn to learn.